Stuart Elster’s oil paintings on canvas explore abstraction through iconographic manifestations of power. Images in Elster’s work are gleaned from the public domain; appropriating currency (Abraham Lincoln’s cabin embossed on the back of a penny), fashion (the label from a Marc Jacob bag) and war (stock images of warships from WWI and WWII). Constructed through bold strokes of a palette knife, Elster’s richly painted works simultaneously build and subvert the image, questioning the nature of representation and its source. Stuart Elster work has been exhibited nationally and internationally, including solo exhibitions in New York, Paris and Amherst. 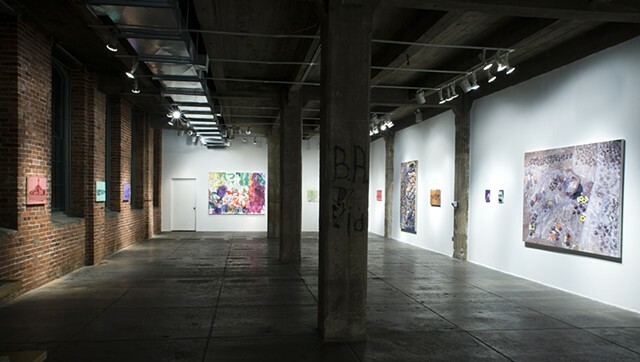 Reviews of Elster’s work have been printed in the New York Times, Artcritical, and Kunstforum. Stuart Elster lives and works in New York. Peter Krashes’ gouache paintings on paper are an examination and critique of power from personal experience. Krashes’ paintings are an extension of his work as a community organizer and leader in Brooklyn. The images in Krashes’ paintings are derived from photographs he takes from his public life. The paintings question where power resides; in the building that houses local or federal government, the camera that mediates our view of governance, or the home-made protest signs and children’s painted faces from political rallies. Peter Krashes’ solo exhibitions include Theodore: Art, Derek Eller Gallery, and Momenta Art. Krashes is a recipient of the Joan Mitchell Foundations Painters and Sculptors Grant. Reviews of his work have been published in the New York Times, Time Out New York, and The New Yorker. Peter Krashes lives and works in New York.